The building of Karlastaden and Karlatornet in Gothenburg has just started. 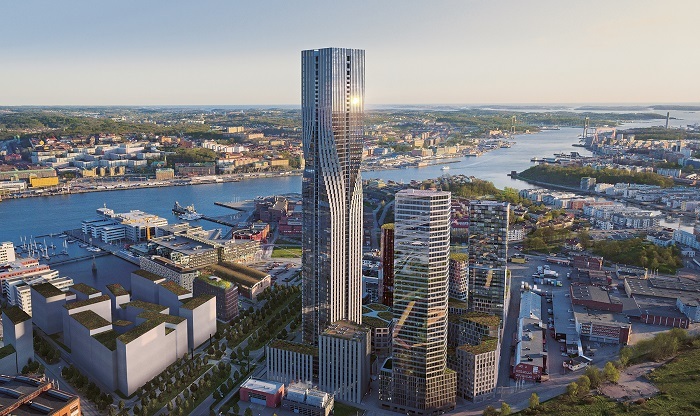 The tower, Karlatornet, will be the tallest building in the Nordics. In cooperation with the Builder, Serneke, Bravida is responsible for the projecting, calculation and planning of all installations in the tower. This agreement covers Phase 2, the projecting phase of the tower, Karlatornet. The intention of this cooperation is that it will lead to Bravida getting the responsibility of implementing all the installations in the tower. – The building of Karlatornet is a challenging and unique project which we look forward to follow through. After an extensive tendering process with tough competition, the choice fell on Bravida who we will cooperate with to project, calculate and plan the installations in the tower, says Nikola Jovetic, Construction Manager Serneke Bygg, Special Projects. Karlatornet is the beginning of a completely new area in Gothenburg. The work with building the tower will be one of the most important projects in western Sweden in recent years. The tower will be approximately 250 meters tall and during the most intense building period it will grow with about one floor per week. The new skyscraper will contain around 590 apartments and one hotel with 350 rooms. – Karlatornet is a large and complex project. By being included in the projecting of all installations in an early stage, we get a good position to create the best solutions for our customer, both from a production- and a managing perspective. Given our knowledge and competence we are well positioned to join in on developing one of Gothenburg’s most exciting building projects, says Anders Ahlquist, Head of Division South, Bravida. Construction start is at year end 2018/2019.